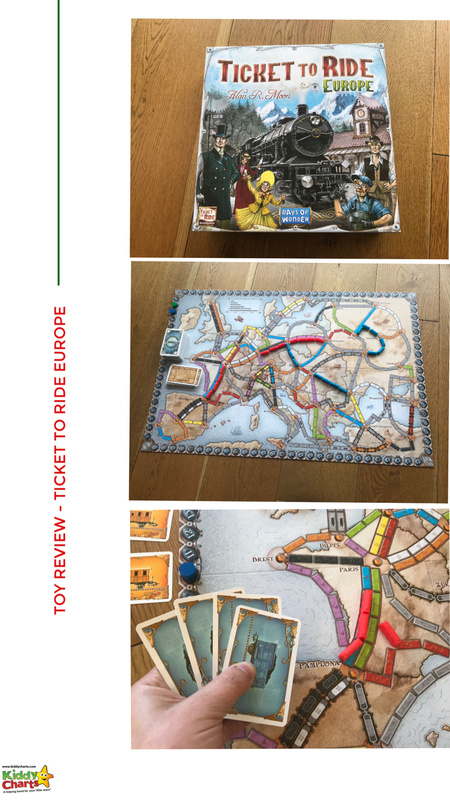 We are lucky to be a member of the Blogger Board Games club, and have been asked to review three games for slightly older children. Our first game is Ticket to Ride: Europe edition. 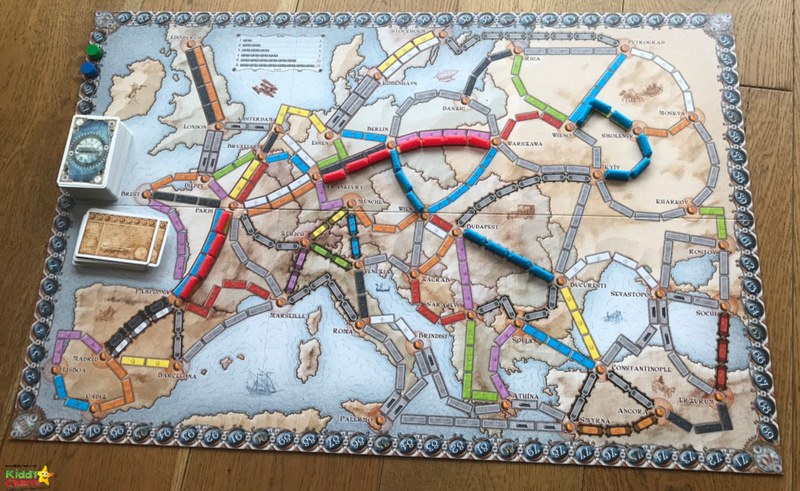 What is Ticket to Ride: Europe? This is a wonderfully presented and educational game, with a really simple premise. You need to connect the ticketing routes on the board; which is a simple map of those routes. Routes are from various different cities in Europe, so give your kids a bit of a geographical drilling too! In order to build routes, you collect locomotive cards after having chosen your ticket cards for those routes. 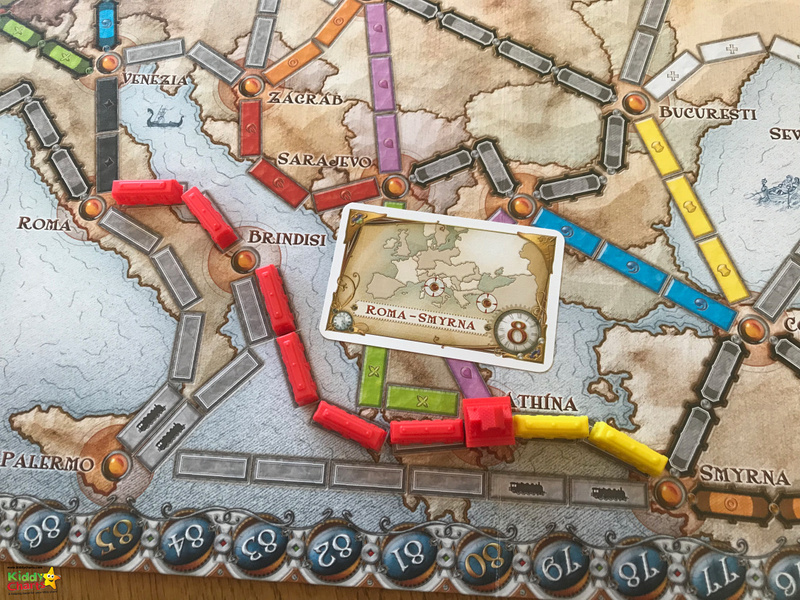 To claim a route you can either add a station to the board, or add your coloured train carriages over the short route, to connect to make much longer routes. Points are scored for the routes you build, based on how many carriages they take, and for connecting specific cities as instructed on your ticket cards. The outside of the board, coupled with the coloured counters, acts as a score board throughout the game. There is an explanation of the set up for the game from the same channel available too. The game is aimed at 8+, and this is definitely about right. The rules aren’t too complicated to learn. The real trick is in the gameplay; it is a simple game to learn, but a tough game to excel at. 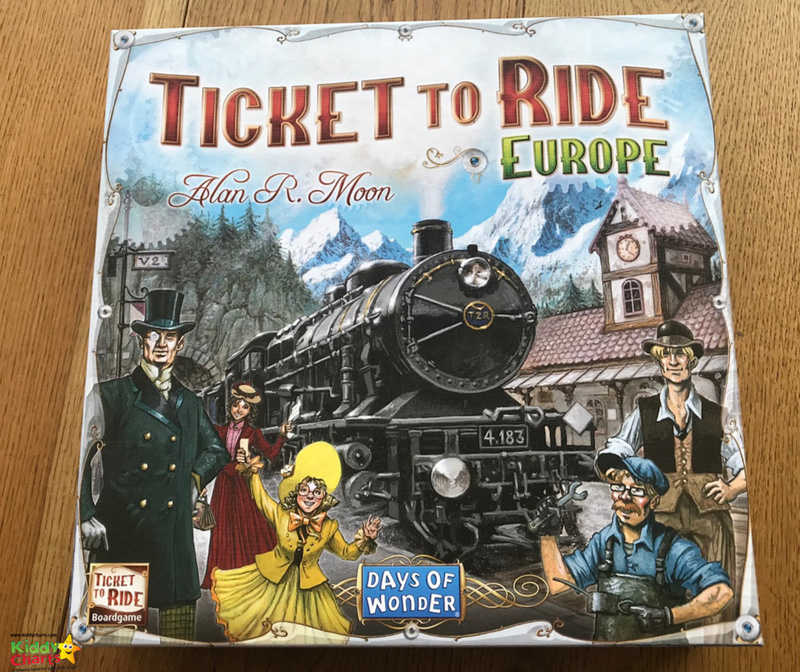 What did we think of Ticket to Ride: Europe? We have the original Ticket to Ride game from Days of Wonder. There is an astounding selection of games in the Ticket to Ride series. This is a slightly different version to the original, with the addition of stations, short and longer route cards, and tunnels. Despite the additional game play elements, the game is still easy to pick up, and the kids adored playing it from the off. Just as they have with the Ticket to Ride original version. The board does seem to have less routes, but the addition of the stations means that it is still possible to complete routes without having to build across the board. Placing a station allows players to “claim” that location, and use trains which other players have placed to complete their routes. This adds another dimension to the board, without excessively complicating the gameplay. However, as the game board, and the pieces are fabulously sturdy, there isn’t too much danger of anything breaking. Even with the most voracious of tantrums! This is a board game we wouldn’t hesitate to recommend for older children. My boy is ten, and for younger than this, they would understand, but might need a little guidance earlier in their gaming life. For example, it can be hard to work out what to collect, and when from the locomotives stashed on the table. We found it was helpful playing a few open hands with these to begin with; just to offer a spot of advice. The kids found it helpful to do this to understand how many cards they needed for their trains, and how many moves building those trains meant their counters could make around the board. There is a card for reference for each player, as well as notes on the board; which is great as its rather tough to remember. Most of the points are totalled at the end of the game; perfect for a bit of a maths challenge, but also another place in the game that you might need to help the younger kids. Finally, one of the easiest mistakes to make, is to get carried away with building your routes, but not think ahead to how many train carriages you have left to actually build them. You only get 45 trains, and the game ends when someone gets to 2 or less carriages. When this happens, everyone else gets one more turn, and then all the points are added up. Many a time we have realised that we don’t have enough trains to complete that awesome 20 point route! In other words, you have to be old enough to plan ahead a little bit, and to think about which routes are best to build and when. In addition, each go you have to decide what move, of a few different choices, is best to make for you. Perfect for building problem solving skills, but also a little daunting if you are on the smaller side. 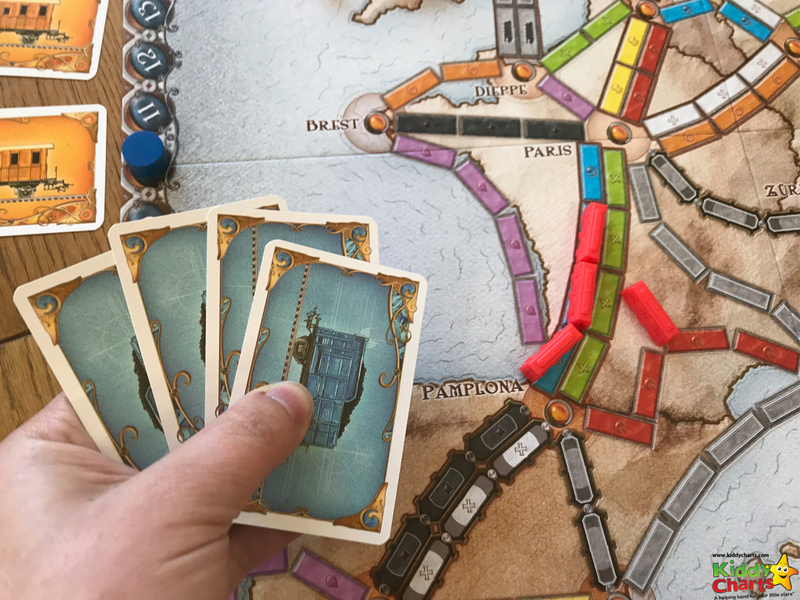 This is still the most bought and played train game worldwide, and we can see why – so why not get a version of it, and get train route spotting! We hope that you liked this review, do check out the other articles on the site while you are here. For example, we have LOADS of free resources for parents to keep their kids entertained. So why not check these out too? If you like these, why not sign up to our weekly newsletter too? It is also worth following us on Pinterest too, we love sharing other people’s resources over there as well. Plenty for keeping those little (or not so little) ones entertained! Thanks again for popping over, and have a grand day. Note: We were sent a free copy of this game for this review, and this article contains affiliate links. All opinions are our own.